In the western mountains of North Carolina, George Pemberton returns to his logging camp with his new bride, Serena. They are now partners in this business of logging as much of western North Carolina as they can. But the government is working to put a park in that area, and they're buying up land to save it from the loggers, as the Pembertons try to beat them to the land. At the same time, the Pembertons are also dealing with the fact that George fathered a child with a woman who works in the camp before he met Serena. As Rachel struggles to raise her son alone, she soon finds herself struggling to keep them both safe from jealous Serena. 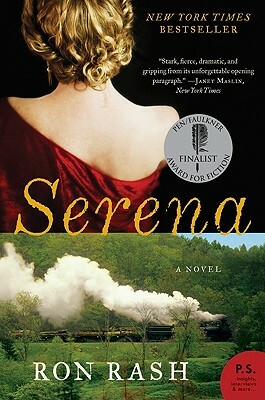 Last year, one of my favorite books was One Foot in Eden by Ron Rash, so I decided to pick up another of his books, Serena . While set in a similar location as the first book I read, this book is very different in both the writing style and the characters it features. Serena is a strong woman, but that's probably too nice. She's a brutal woman who is conniving and harsh, a woman who will stop at nothing to get exactly what she wants. She convinces her husband and her "henchman" to kill anyone who gets in their way, and shows absolutely no remorse. She is a very unlikable person. What I loved about the book is the way Ron Rash paints a picture of western North Carolina in 1929, without a lot of boring descriptions. So much is gleaned from the conversations between loggers and the many interesting supporting characters. He truly shows the harshness of the environment in which they worked, and the danger of the job they had to do. But the coldness of the Pembertons seemed unnatural. Some of the incidents, including a fight with a bear and Serena's ability to train an eagle, were a bit outrageous. In addition, the storyline with Rachel and the baby seemed like it should have been more prominent in the novel. When she is introduced early in the story, you get the impression that she will be a big part of the book. But her life just runs parallel to the Pembertons' until Serena decides she doesn't want the baby around anymore. Then it's the main storyline through to the end of the book. I just feel like more could have been done with it, although looking back, I can see the way Rash used the two separate lives to show the differences in the way they interacted with the environment. I think Rachel's kindness and mothering abilities also made Serena's weaknesses more evident. I will say this was a great selection for the month of April, as Earth Day is almost upon us. It shows how bad logging is, although I think it actually makes loggers look even worse than they probably are. The Pembertons have absolutely no appreciation of the environment whatsoever. All they care about is money and power. While others try to preserve the land within a park, and Rachel takes care to use the plants around her home for good, the Pembertons are doing all they can to tear down as many trees as they can as quickly as possible. In the end, this was a decent book and I think it would actually make a great book club selection because there are several topics to cover. But it wasn't nearly as good as the first book I read by Ron Rash. I do think I'll try him out again at some point. Being in North Carolina, I love reading about the land and the people who lived in the mountains here back in the early 20th century. This review was written based on a copy of Serena that I received through Paperback Swap.